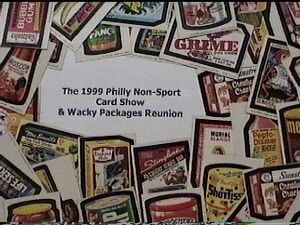 Here it is Wacky Packages fans... the "wacky event of the century", the 1999 Philly Non-Sport Show and Wacky Packages Reunion complete on home video! Whether you attended this great weekend long event or not, here's your chance to see it all on an almost 2 hour long video! From the 2 day show, to the panel discussion, to the awesome wacky collectors museum, it's all here! This video comes complete with my own titles, intermissions and credits thrown in to make it a complete package. I even used my own wacky packages collection as props to add even more excitement to it! Day 1: The show begins! Here we see some of the big-time east coast wacky packages dealers in action and the crowds of collectors looking for that great deal. 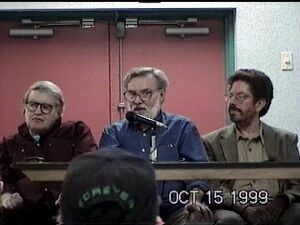 The Panel Discussion in it's entirety. 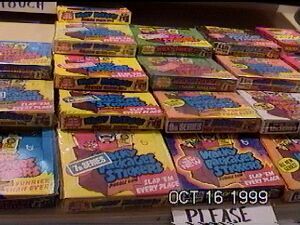 Here you will see Topp's Jay Lynch, Len Brown, Zina Saunders, Bob Stewart and others answering questions from some of the biggest wacky packages collectors in the country! Find out what really happened behind the scenes at Topps during the Wacky Packages craze. 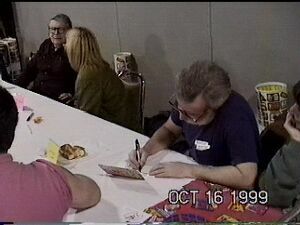 Day 2: Back at the show again and here we have Jay Lynch and friends answering questions and doing autographs. If you purchased one of Jay's own greeting cards and asked him to draw something on it for you, he did! I even included a close-up of the drawing he did for me in this video! The show's over... but the wacky weekend continues!!! 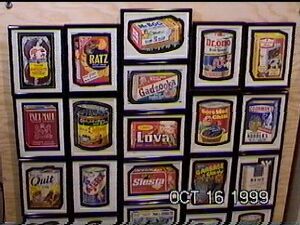 What we have here is the HIGHLIGHT of the entire weekend, the Wacky Packages Collectors Museum! You won't believe your eyes looking at rare one-of-a-kind items as well as complete sets like these original boxes from every series! 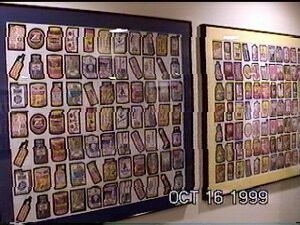 Uncut sheets are a wacky collectors dream, here we see two of the 30+ uncut sheets on display!!! Almost every series is represented here including the rare die cuts uncut sheet! and now for the best part... ORIGINAL ART!!! 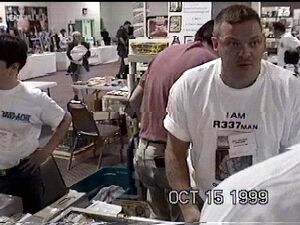 Almost 50 pieces of original series art was displayed here, owned by some of the biggest wacky collectors across the country. Notice the 3D look from that beautiful Dr. Ono original art? Norm Saunders was the man!